As the cheapest possible 3D plasma TV available from Panasonic, the VIERA TH-P50UT30A has a lot to deliver: it’s a 50in screen that can be found for under $1000, with built-in Web apps and video on demand. Premium features are at a minimum, but anyone wanting them can easily purchase an appropriate Blu-ray player with these extras built in. The Panasonic VIERA TH-P50UT30A is the company’s cheapest 3D plasma TV, and its second cheapest 3D TV overall. It’s cheap when you consider that for less than a $1000 (street price) you get a 50in current-generation plasma panel with a 2000000:1 contrast ratio and 3D support, including 2D to 3D conversion. The Panasonic VIERA UT30A plasma TV doesn’t have the styling flair of a Sony HX925 or Samsung Series 8, but it’s not an ugly set — despite the two-tone finish, the UT30A looks clean and simple. Its black bezel is quite shiny, and is thicker than competitors’ sets — this means it sometimes causes distracting reflections if you’re sitting in the wrong spot in a brightly-lit room. The 50in model of the VIERA UT30A measures 1212x782x93 mm and weighs 34kg when it's assembled — its wall-mounting weight is around 30kg. It's thicker and heavier than an equivalently-sized LED TV, but this is true of almost all plasma TVs. If you want a thin plasma, you'll have to spend a lot more than $1000 to get one. Panasonic has a simple and attractive -- if slightly gaudy -- menu system. The screen of the Panasonic VIERA TH-P50UT30A is not as glossy as its bezel, but it still reflects light sources placed directly in front of it. We’d put it about half-way in between a matte TV screen and the super-glossy Sony HX925 in terms of reflectivity. As usual we’d recommend removing as much light from your viewing area as possible — invest in some good curtains — and using a bias light to reduce eye strain if possible. 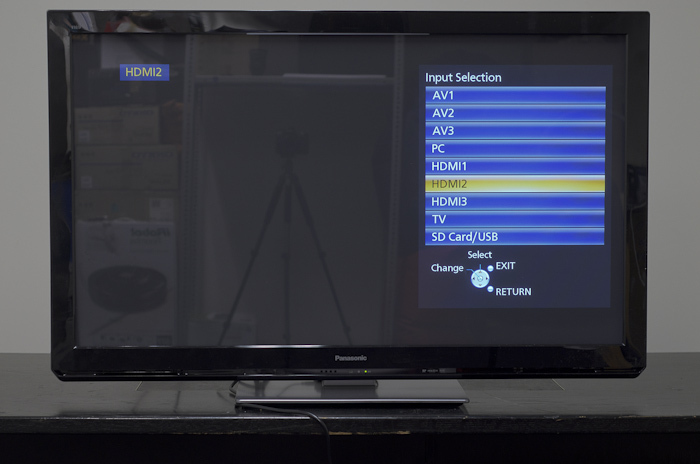 You can choose from three HDMI ports, various A/V connectors and SD/USB input on the Panasonic VIERA UT30. The Panasonic UT30’s feature-set is basic when compared to premium Panasonic models (and the majority of models from LG, Samsung and Sony): it’s got three HDMI ports rather than the usual four, no built-in Wi-Fi, and no 3D glasses are included in the TV kit. 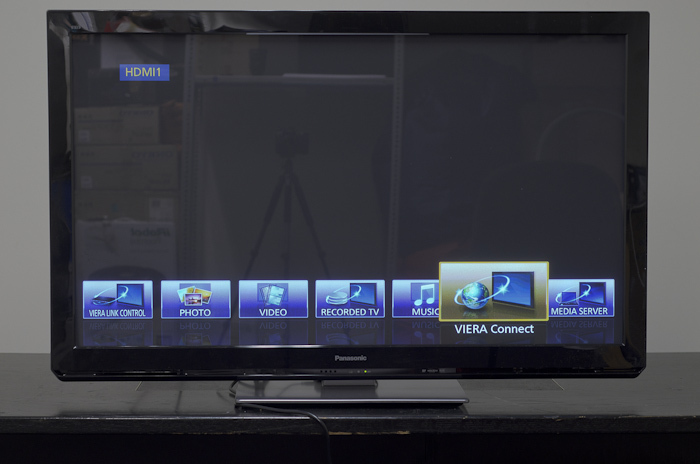 If you can hook up an Ethernet cable, or if you want to spring for the $99 Wi-Fi USB adapter, the VIERA UT30A has built-in access to Panasonic’s VIERA Connect online app market, which has video on demand services from YouTube, ABC iView and Yahoo!7 pre-loaded. There are several dozen apps available including Facebook and Twitter. The app interface isn’t as good as LG and Samsung’s services, which are more comprehensive and easy to navigate, and Panasonic doesn’t have as many apps on its market — but this isn’t a problem if you’re only looking for the major video on demand services (iView and YouTube are our perennial favourites).